Char grilled steak cooked on a seasoned flat top, served in a warm corn tortilla and topped with salsa verde, onions, and cilantro. 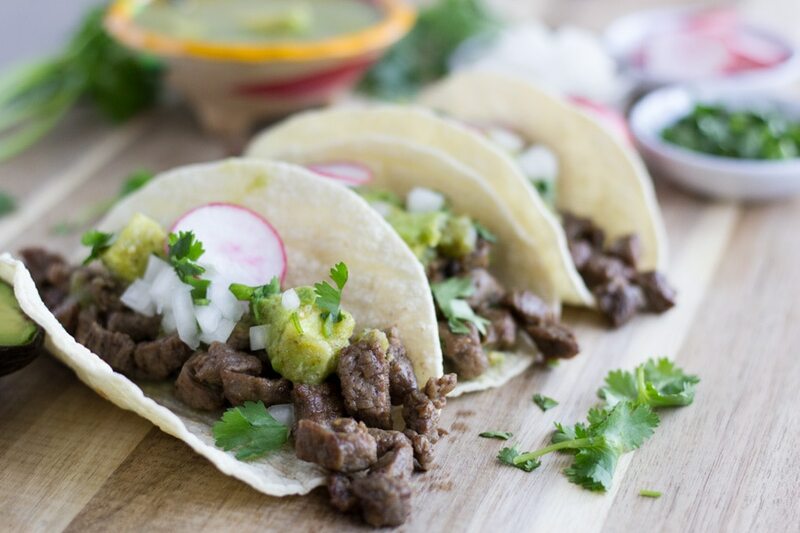 There’s never a shortage of street tacos in Mexico and perhaps the most popular being Carne Asada. 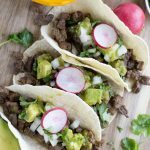 There are different versions of carne asada, and most of them incorporate a marinade to the meat to make it tender and flavorful. However, the recipe I’m sharing today requires no marinade and instead imparts flavor from the salsa and toppings. The key to making a delicious no marinade carne asada is to use a good piece of steak. I recommend a NY Strip or Sirloin steak, the excess fat trimmed, and then diced into small bite size pieces. 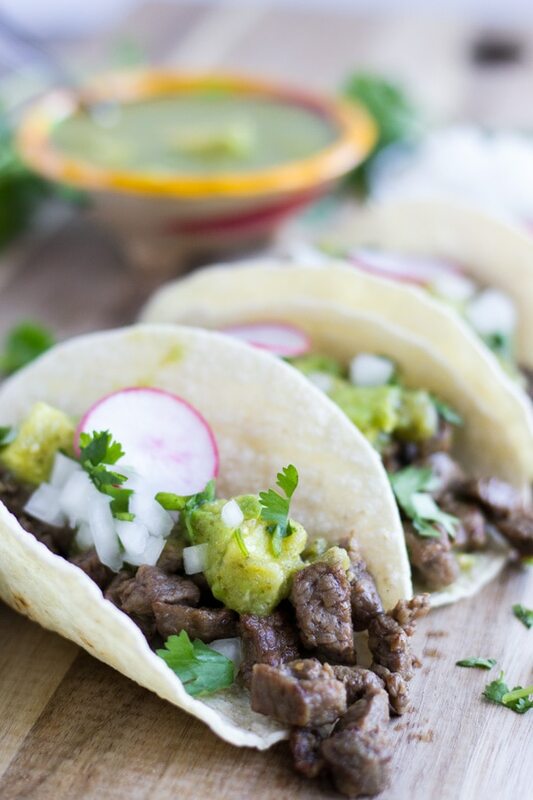 The marinated carne asada uses a cheaper cut of steak like flank steak, and the marinade helps to tenderize the meat. But I prefer spending a little more on the steak, saving time, and still getting delicious tacos. Another tip is to use a seasoned cast iron flat top like this one that we love. I prefer cooking the carne asada on the grill with the flat top, but you could also do this on the stove using the same cast iron flat top or skillet. Be sure to get it nice and hot, and add some high heat cooking oil like canola, avocado, or grape seed oil. After the steak has been diced into small even pieces, add 1 teaspoon of salt per 1 pound of meat, 1/2 tsp of black pepper, and 1 tablespoon of oil. That’s it for the steak, super easy! My husband likes to eat the tacos with grilled onion bulbs on the side. Now for the toppings, don’t skip them, especially the Salsa Verde! After the salsa verde has been made, be sure to cool it in the fridge, and prior to serving portion out about 1 cup and add diced avocado to make a chunky salsa. You’ll also want to have finely diced white onion, chopped cilantro, and sliced radishes for toppings. To serve the carne asada, place tortillas on the flat top till they get soft and keep them warm in foil. 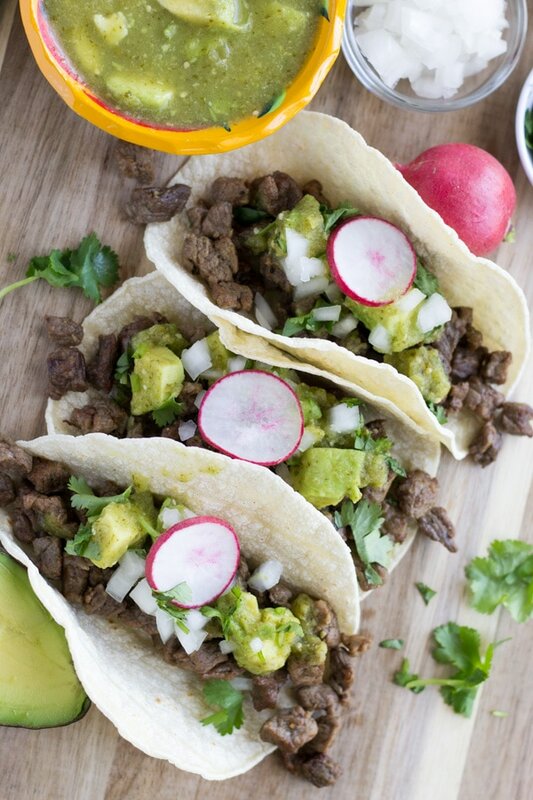 Layer the carne asada, then salsa verde with avocado, onions, cilantro, and sliced radishes. These are great for a party and you can prep the meat and salsa ahead of time. Trim excess fat from steak and cut into small bite size cubes. Season steak with oil, salt, and pepper. 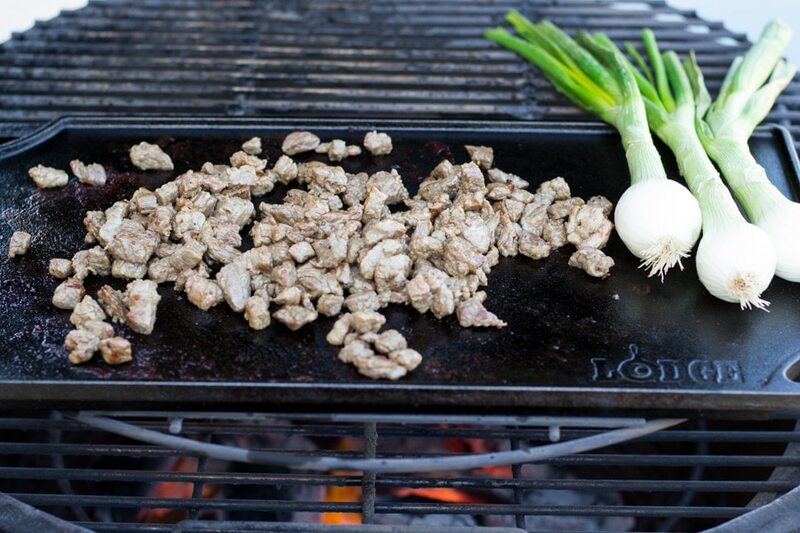 Heat a cast iron flat top over the grill or stove on high heat. Add a tablespoon of oil and seasoned cubed steak. Use tongs to move steak around till all sides are cooked and you have some crispy pieces. Remove steak, place in a heat proof dish, and keep warm in the oven or warming area of the grill. Warm tortillas on the flat top and keep warm in foil. 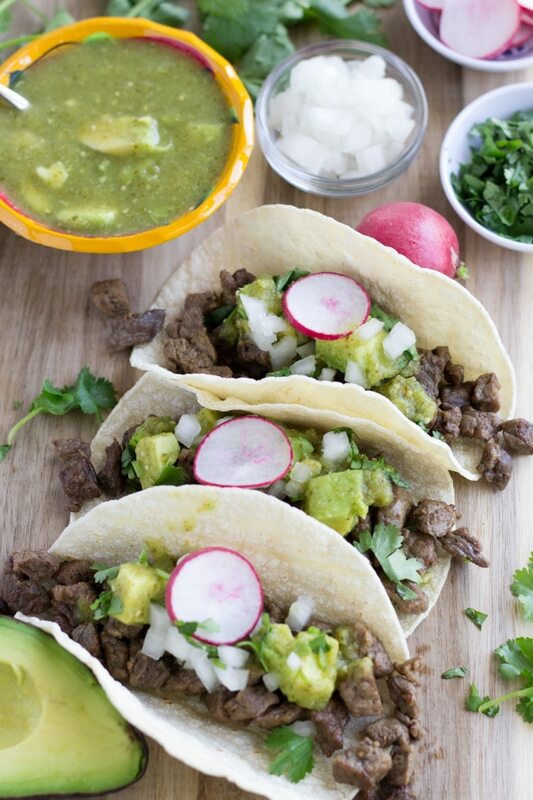 Serve Carne Asada tacos with Salsa Verde, onions, cilantro, sliced radishes, and grilled bulb onions or jalapenos.